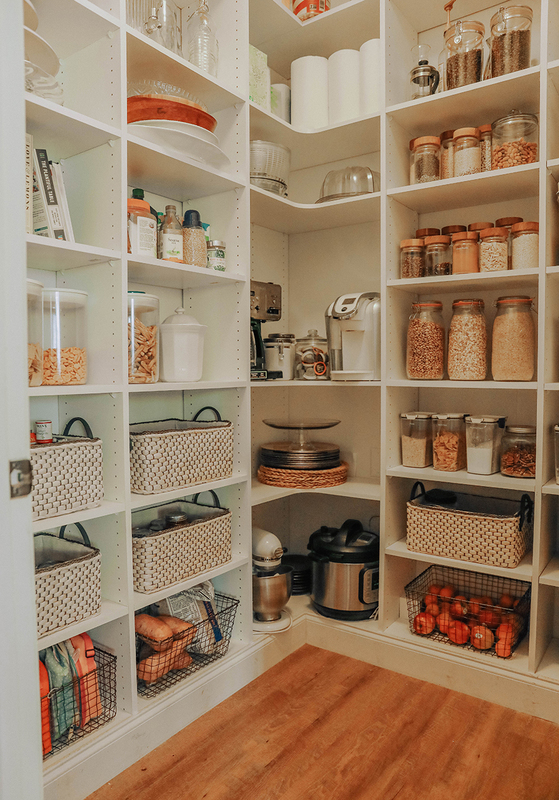 We converted our laundry room into a walk in pantry last year, and I wasn’t sure if we would actually be able to stay on top of it being organized! 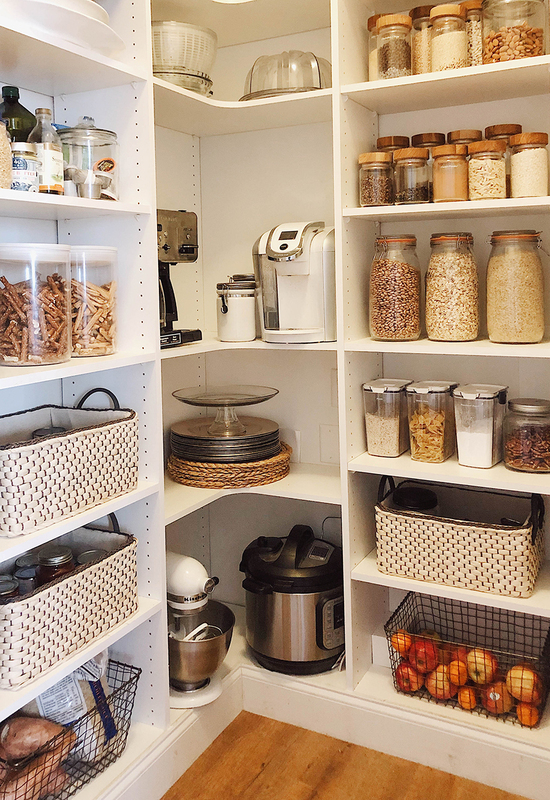 We still have the small side pantry in the kitchen which many of the odd end items and half eaten bag of chips land. 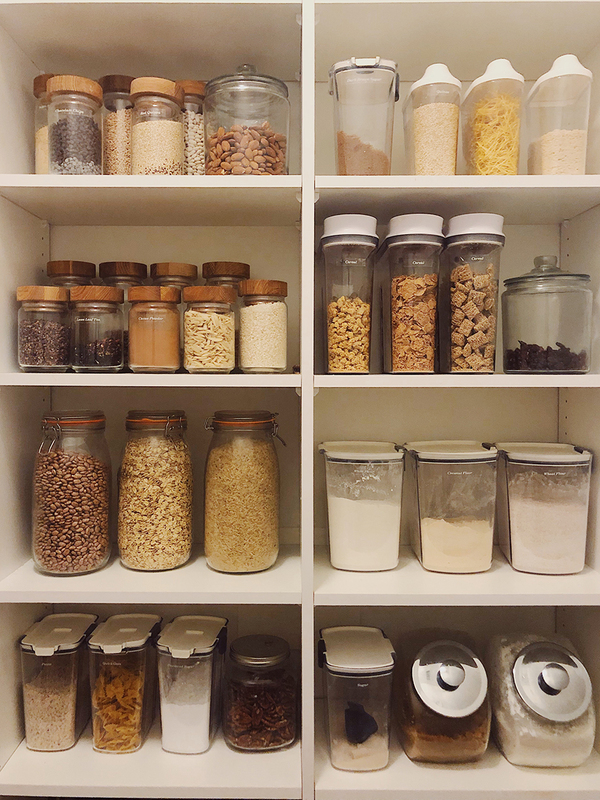 Overall, we’ve been able to keep up with this setup, and this pantry has been so helpful with staying on top of food organization. We no longer have to store half of of our food items in the garage, and we can now keep better track of what what food we have in stock and what we are running low on. Having a place for everything has really cut down on waste and spending! I do miss having the laundry room on the main floor since I seem to never be able to remember the wet load that needs to be switched to the dryer! It hasn’t been too bad though since it is now right off of the studio/play room in the basement. We are hoping to finish up the laundry space soon. 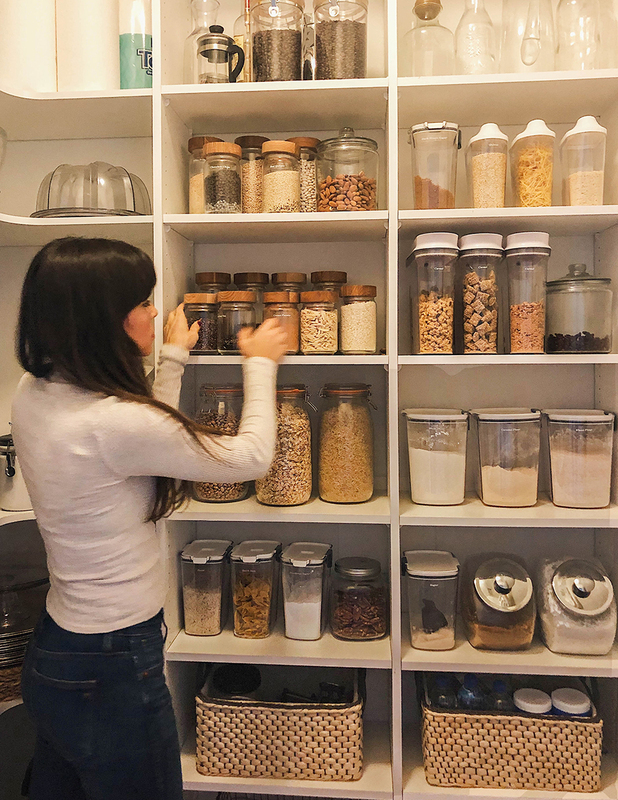 If you want more details on how we built the pantry shelving you can read this post. You can find a few of our go to dinner recipes for our family in the recipe gallery! I’m really happy with the storage pieces we ended up choosing for this space! 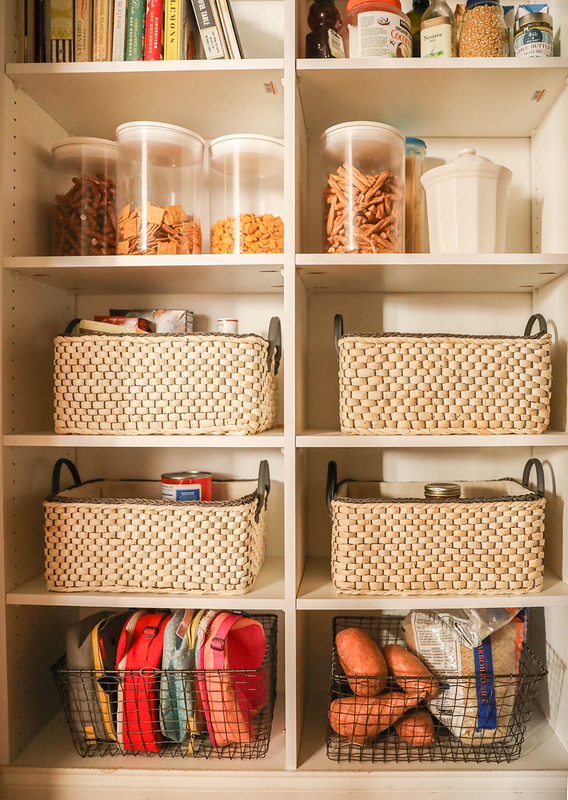 The woven baskets have been really helpful for canned goods, open packets and bags, snacks, etc. The wire baskets are fantastic for potatoes and larger fruit as well as storing things like lunch boxes or paper party products. Glass canisters vs solid canisters are much easier to keep to track of what you have and how much. (This is the labeler I used for the canisters.) We do have to lock this place up though to keep it safe from toddlers constantly on the hunt for snacks. Yay – some finally showing where/how to store those insulated lunch bags  love it all! ha ha ha! Yes those darn lunch boxes! We are Costco fans through and through. I’d say that 95% of my families needs are bought there. We live a distance from town and so it’s nice to stock up for about two weeks worth of food and home supplies. A new source that I’ve also come across is called boxed.com . It’s a online grocery store . They don’t have fresh or perishable goods but many other great things. The items are then delivered to your home ( via ups ) . They have good prices and carry items that my Costco doesn’t. Maybe you or your readers will enjoy Boxed.com like I do. Keep up the great work Anna ! Also, brilliant idea turning your laundry room into have a good working, practical pantry . 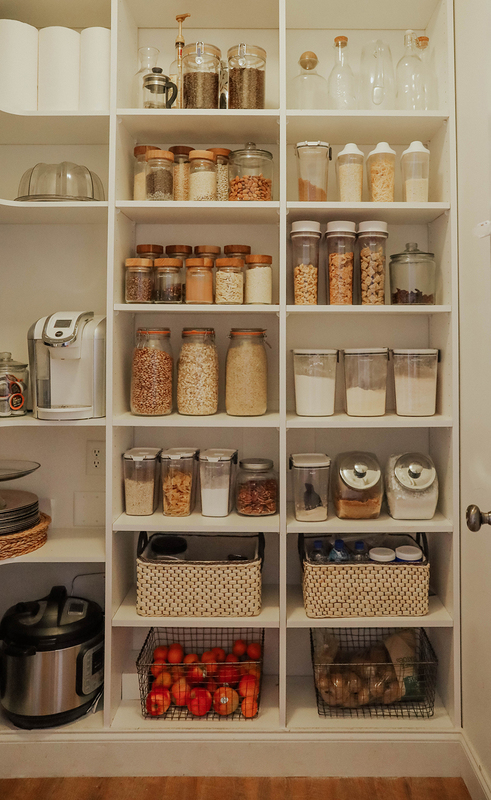 Love your storage choices of baskets and glass jars. So fresh!